Despite having been in possession of Ant Soldiers for some time now, we’ve had to delay the inevitable review while we investigated a troubling report that exists on one of the few online FAQS for the game. No, we’re not talking about the obvious here, which is that Ant Soldiers is such a bare faced clone of the home computer classic Lemmings that it probably even made developer Sachen blush! That didn’t bother us in the slightest. We have many fond memories of playing Lemmings on the Amiga back in the day and in this day and age, it hardly matters that a platform as obsolete as the Mega Duck once got a game that should, by rights, have fallen foul of every copyright law there was. There was something more troubling that held back this review and which, we are happy to report, we can now lay to rest. However, before we discuss what Ant Soldiers isn’t, let’s discuss what it is. 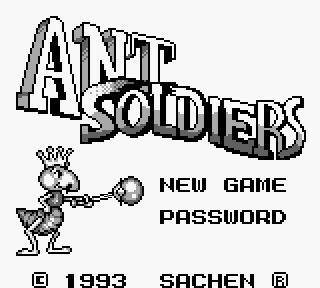 Ant Soldiers IS Lemmings, in almost every aspect bar the main sprites themselves who have been, for lack of a better copyright, replaced with the titular insects. It seems almost redundant to describe what Lemmings, and by proxy Ant Soldiers, is here, but for the uninitiated it’s a real time puzzle/strategy game where you are tasked with guiding your wandering herd to an end goal by assigning individual members different tasks from a preset list of abilities. You can opt to have one member dig through a wall, for example, or have another act as a blocker to redirect the flow of traffic. All the while, death waits in a variety of places, from drowning to falling too far to being incinerated by fire, strategy must, therefore, be used to ensure your herd (or in this case colony) reach the end goal intact. Ant Soldiers doesn’t try to do anything new with the Lemmings formula, giving you the exact same abilities and in some cases the exact same stages to solve. There are sixty levels in total, split into four different groups of 15, with each group being progressively harder. While some stages replicate familiar Lemmings stages, others are entirely new. Thankfully infinite continues and a password system (as well as a couple of cheat codes) ensure you retry a stage or pick up where you left off, a big bonus for a portable outing. The game opens to a nice little sideshow credits sequence that again demonstrates the talented artists that Sachen had...despite their almost total lack of original thought when it came to game concepts. A lemmings-esque pre-level breakdown lets you know the requirements for each stage. Some stages, such as this first one, accurately mirror real stages from their direct source of inspiration. However the game also features many custom made levels in its 60 stages. While the Mega Ducks d-pad can never replicate the smooth mouse controls of the original Lemmings, Ant Soldiers does not feel too sluggish and does an admirable job of making things easier for you. Unlike the Game Boy port of Lemmings, the HUD is ever present on the screen and can either be rifled through with the select button or manually selected by scrolling down the cursor and then using the d-pad to select an attribute. Thankfully the game can be paused at any time to allow you to scroll around the map and highlight the relative attribute, which removes the frustration of what would otherwise have been a slow and cumbersome selection process in a game requiring fast responses. Despite being small the graphics are wisely kept simple enough to see, until, that is, all forty or so ants have appeared on screen at once. Unfortunately the Mega Duck simply cannot cope with this number of moving sprites without side-effects and, in this case, the side effects are the parade of ants turning into a weird homogeneous blur. While this is hard to look at, thankfully stages appear to have been plotted well enough that it doesn’t become too much of an issue when trying to select an individual ant. Musically the game bleeps and bloops along without attempting to copy any of the core Lemmings tracks, although fans of classical music will spot 8-bit re-imaginings of Shubert, Carmen and Beethoven in there. So onto perhaps the most contentious issue about Ant Soldiers: the issue of whether or not it is fundamentally broken! On researching the number of stages present in the game, we discovered a FAQ on Gamefaqs (albeit for the identical Game Boy port) seemingly written with authority and stating that the game was physically impossible to beat, with several stages, including the final one, rendered such by the game’s level requirements. We decided to test this out and after successfully beating two of the “impossible” stages and finding evidence that greater Lemmings experts than ourselves have successfully beaten the entire game, the assertions of this FAQ can be successfully dismissed as untrue. Don’t believe everything you read on the internet, folks! ALL of the stages on Ant Soldiers can be beaten, just not in the way that the FAQ writer seemed to think was necessary. So, now that this concern can finally be laid to rest, how good a game is Ant Soldiers in its own right? Well, it’s certainly the most shameless knock-off that Sachen produced for the Mega Duck. However it’s also a shameless knock-off of one of the best games of the 90’s that perfectly captures its feel and gameplay. While it does lose points for originality it’s undeniably fun and the password system is perfectly tailored for handheld play. Playing pretty far into the game, we’ve never yet reached a point that felt it couldn’t be mastered with enough practice. There’s also a nice feeling of presentation that matches some of Sachen’s other Mega Duck titles like Worm Visitor, with cute little cut-scenes in the opening credits and even a little ending scene, complete with humourously garbled translation. Ant Soldiers is a fine entry for the Mega Duck, despite its litigious nature. It plays a good game of Lemmings and is well adapted for handheld gaming. Despite the problems with blurring that occur once a full group of ants get trapped in close quarters it’s usually easy to see what is going on, despite the obvious drawbacks of the Mega Duck’s screen. It’s certainly one of the key titles you should seek out if you plan to collect for the system. Even if it's just to see how the hell you DO beat that final level!